sbiosubplot(sd) plots each simulation run from sd, a SimData object or array of objects, into its own subplot. The subplot is a time plot of each state in sd. sbiosubplot(sd,fcnHandle,xArgs,yArgs) plots simulation results by calling the function handle fcnHandle with inputs sd, xArgs, and yArgs. The inputs xArgs and yArgs must be cell arrays of the names of the states to plot. sbiosubplot(sd,fcnHandle,xArgs,yArgs,showLegend) also specifies whether to show the legend in the plot. If true, the function shows yArgs as the legend. sbiosubplot(sd,fcnHandle,xArgs,yArgs,showLegend,Name,Value) also uses additional options specified by one or more name-value pair arguments. For example, you can specify the x-label and y-label of the plot. Plot the prey versus predator data from the stochastically simulated lotka model in separate subplots by using a custom function (plotXY). 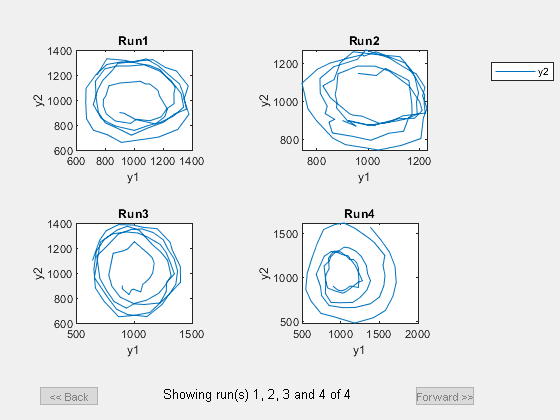 Plot each simulation run in a separate subplot. By default, sbiosubplot shows the time plot of each species for each run per subplot. Plot selected states against each other; in this case, plot the prey population versus the predator population in separate subplots for each run. 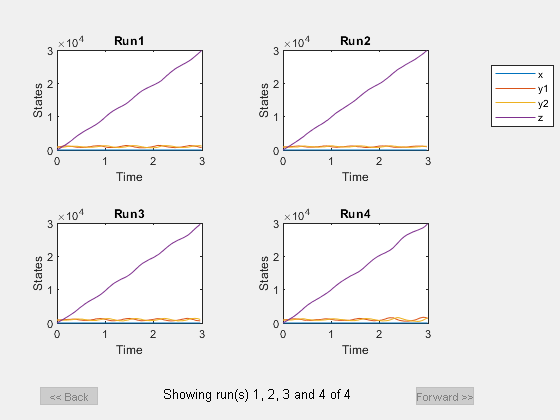 Use the function plotXY (shown at the end of this example) to plot the simulated y1 (prey) data versus the y2 (predator). Specify the function as a function handle in the sbiosubplot call to plot each run in its own subplot. In this case, the fifth input argument (showLegend) is set to true, which means the fourth input argument (yArgs) is shown as the legend. The plotXY function plots two selected states against each other. The first input sd is the simulation data (SimBiology SimData object or vector of objects). In this example, xArgs is a cell array containing the name of the species to be plotted on the x-axis, and yArgs is a cell array containing the name of the species to be plotted on the y-axis. However, you can use the inputs xArgs and yArgs in any way in your custom plotting function. No output from the function is necessary. Function to generate line plots, specified as a function handle. For an example of a custom function to plot selected species from simulation data, see Plot Selected States from Simulation Data in Subplots. The inputs sd, xArgs, and yArgs are the same inputs that you pass in when you call sbiosubplot. No output from the function is necessary. Logical flag to show the plot legend, specified as true or false. If true, the function shows yArgs as the legend. Example: 'xlabel','Species A' specifies the x-label of the plot.